The nearby Epsilon Eridani star system, Spock's home in Star Trek lore, actually turns out to have at least one Jupiter-like planet, a couple of asteroid belts, and a broad ring of icy material like our solar system's Kuiper Belt, according to a NASA press release (Pound360 originally read about this story at Discover's 80beats blog). 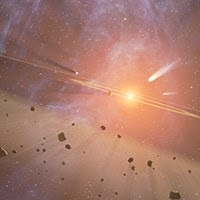 There's almost certainly more to come as science continues to explore Epsilon Eridani. "Asteroid belts are rocky and metallic debris left over from the early stages of planet formation. Their presence around other stars signals that rocky planets like Earth could be orbiting in the system's inner regions, with massive gas planets circling near the belts' rims." As it turns out, a gas giant is circling just outside of Epsilon Eridani's inner ring, just as we have in our system. One thing explorer's probably won't find is intelligent life (so, no Spock). It took life billions of years to evolve from bacteria to Albert Einstein, but the Epsilon Eridani system is just 850 million-years-old (our system is close to 4.5 billion-years-old). Also, when radio astronomers started searching for signals from alien civilization back in the 1960s, they started with Epsilon Eridani, but as far as Pound360 knows, we ain't got nothing yet.